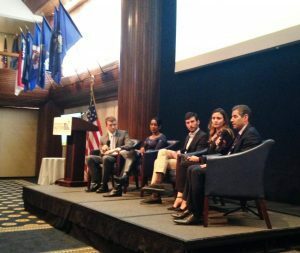 Yesterday, ACT Center for Equity in Learning sponsored the release of Opportunity Nation’s 2017 Opportunity Index at the National Press Club in Washington, D.C., and we were there! Each year, Opportunity Nation publishes its annual Opportunity Index— a composite measure at the state and county levels of economic, education, and community condition. This year, another dimension was added: health. The Opportunity Index allows us to do a state by state comparison of opportunity scores nationwide. Additionally, the Index allows us to drill down and view county opportunity scores and then compare how opportunities widely vary from county to county. The data is interesting and helps us identify where opportunity is and is not in America and where we can make the most impact in high-need areas, especially around access to education. Carlos Watson, CEO and co-founder of OZY.com, shared his inspiring opportunity story with attendees of his journey from humble beginnings to CEO of his own media company. Ja’Ron Smith, director of urban affairs and revitalization, Executive Office of the President, shared a similar success story. Both speakers discussed how they are using their platforms to tackle opportunity inequities in America. The focus of yesterday’s event was access to opportunity in America, where the data in the Opportunity Index can pinpoint opportunity exists. Vermont ranked as the number one state for the seventh year in a row for opportunity for its high marks in the well-being of its economy, access to and attainment of higher education, number of people who have insurance, access to healthy food, and low youth disconnection. Minnesota, Iowa, Massachusetts, and North Dakota followed. The bottom five states include New Mexico, Louisiana, Mississippi, Nevada, and West Virginia. Several factors including higher-than-average unemployment rates, high-poverty rates, lack of affordable housing, low high school graduation rates, shortage of access to healthy food choices, and high number of people incarcerated in jail or prison were factors that affected state rankings. Education opportunity increased by 2.8 percent since 2016 and adult education attainment has increased in every state since 2011; however, access to healthy food has declined in 33 states and low birth rate rose in 26 states. While we are making strides in education, there are other factors that contribute to overall opportunity –and that may specifically affect underserved populations. Creating access to education alone will not close the opportunity gap; we must take into account other factors that affect opportunity such as access to primary healthcare, healthy food, and financial services. 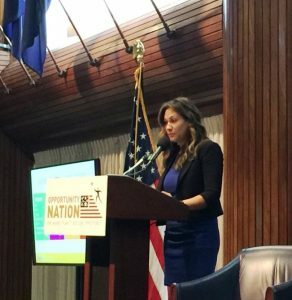 We were proud to sponsor yesterday’s event and of our partnership with Opportunity Nation. We are looking forward to using the Opportunity Index to further our efforts with our partners in creating and increasing access to opportunity for all students regardless of zip code. Want to know the opportunity index in your state or county? You can explore the report here and compare opportunity scores across America. If you would like to continue the conversation, join Opportunity Nation for today for a Twitter chat using #OppIndex to discuss the findings.